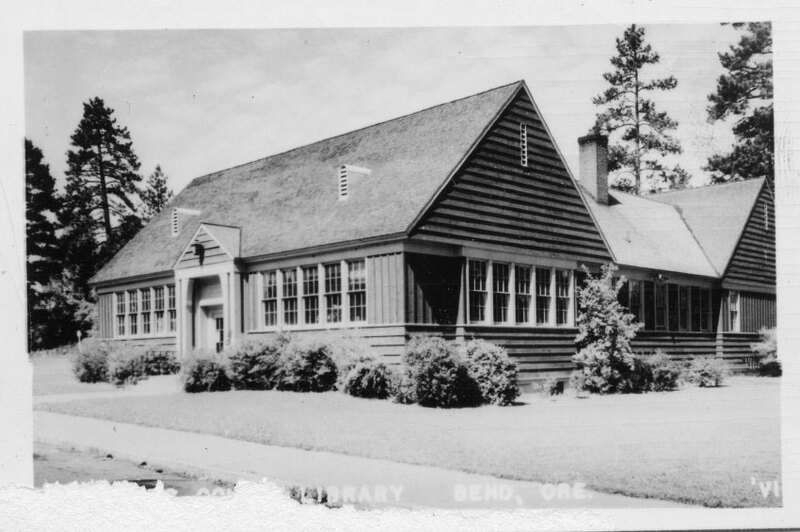 The first library in Bend, Oregon—called the Bend Magazine Club and formed shortly after the city incorporated in 1904—was a small subscription library suggested by early pioneer John H. Overholt. Members paid annual dues to the club, which in turn subscribed to a variety of national magazines. Club members could be found throughout Deschutes County, including Powell Butte and Sisters. The Bend Magazine Club was housed in Mrs. McIntosh’s Millinery store in Bend and included in its collection books donated to the club from local citizens as well as books borrowed from the State of Oregon’s traveling library. Lawrence Building, Wall St, 1910s. 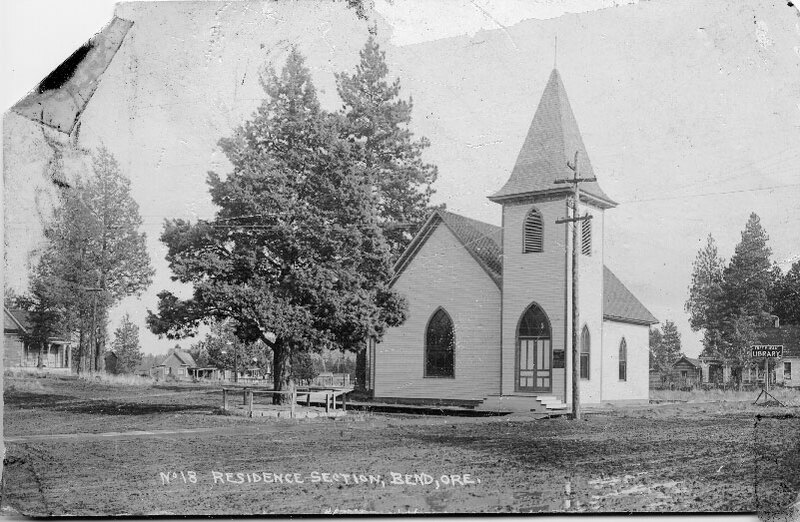 First National Baptist Church, Irving St, 1910s. Public library sign on right. After using the Bend Company room, the library moved to an unused saloon building under the ownership of the U. S. National Bank. The directors of the bank offered the building to the library club for free if they would arrange to move it. The library directors eventually raised the capital to move the building and attach it to the First National Baptist church. 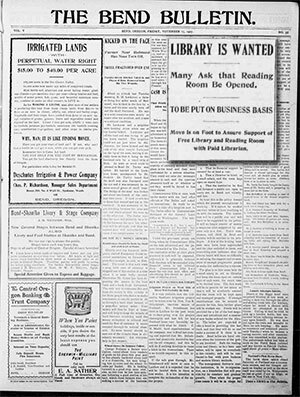 In 1919, the city of Bend approved an annual budget to support the library and in 1920, Deschutes County contracted with the City of Bend to expand library services across the county. By this time, Redmond Public Library had been in existence for nine years, having been established shortly after the town incorporated in 1910. Its first librarian, Ms. Laura Jones, was the niece of Redmond’s mayor. The Redmond library contracted administration of the local library to the new countywide system. A county library board was soon established, hiring Lillian Sabin to be the first professional librarian for the county. Serving on the first board were Mrs. J. M. Lawrence, R. W. Sawyer, George A. Paddock, Mrs. Max Cunning, and Fred Wallace. At this point in time, the library held 3,488 volumes in its collection. 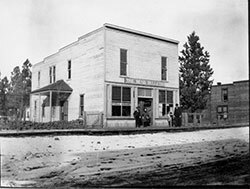 Branch libraries or stations were soon opened across the county in La Pine, Lower Bridge, Sisters, Tumalo, Redmond, Terrebonne, the Brooks-Scanlon Lumber Camps 1, 2, and 3, and Shevlin Hixon Lumber Camp 1. H C Elis Building, Bond St, 1924. 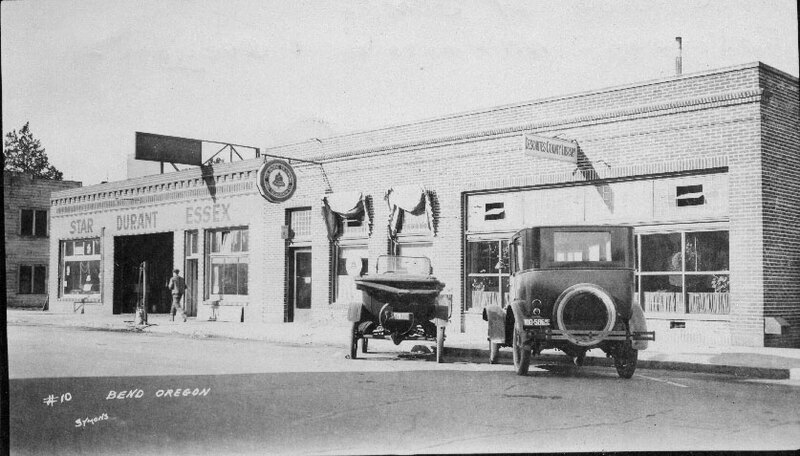 The Bend library, which had stayed for a number of years in the former saloon, moved to the upper floor of the Bend Amateur Club (across the street from the current library administration building) in 1920, and then, in 1921, to the H. C. Elis building on Bond street. In February, 1924, the Bend Company donated a downtown lot to the library which was to be used for construction of a new building. Noted Portland architect A. E. Doyle was hired to draw plans for the new library building. In 1929, Bend architect Hugh M. Thompson reviewed the plans and estimated a significant cost savings if the building were made of wood instead of the proposed brick. However the onset of the Great Depression significantly delayed construction and it wasn’t until 1938, with the help of Public Works Administration and Works Progress Administration grants, that enough capital was raised to build the new library. The library board hired Whitehouse and Church, a Portland architectural firm, to draw up plans, and Byron McDonald of the Van Matre Construction Company in Bend to arrange for the construction. The extent to which Whitehouse and Church’s design for the new building relied upon A. E. Doyle’s original plans is unknown. Final costs of the 8,100 sq ft space totaled about $27,000. It was completed in 1939. The original library building today serves as the administration building for the library district and is listed with the National Register of Historic Places. Additions to the building occurred in 1957, the mid 1960s, the early 1970s, 1978, and 1985. The building is one of few surviving examples of the Oregon Rustic or National Park Style. That same year, the Redmond library received its first permanent home, an 800 sq feet corner of the new City Hall at 6th and Evergreen. Until that time, the library had moved between various tents and rented rooms in Redmond. The Sisters Civic Club also decided it was time to build a proper library in Sisters. Previously, the Deschutes County Library left books at one of the stores in Sisters for pickup from local patrons. The women of the Sisters Civic Club raised funds for construction through card parties and cake walks. Local men donated their labor to construct a 14 x 20 ft building with lumber from the mills. With shelving space for 1,000 books, Sisters residents donated books to supplement those borrowed each month from the Deschutes County Library. The Sisters library officially opened on January 27, 1939. 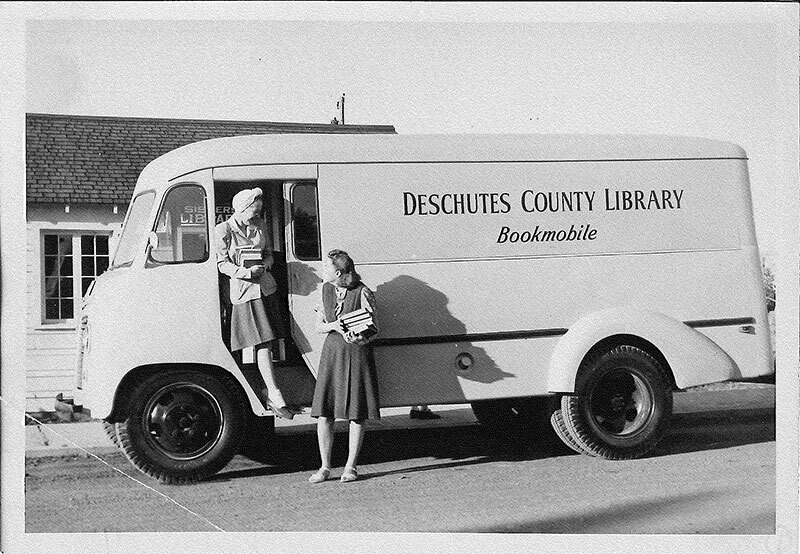 In 1946, the Deschutes County Library ordered its first bookmobile, a 1.5 ton Vanette bookmobile with a Ford chassis. 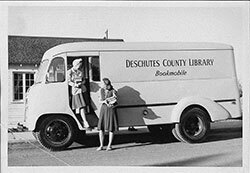 The bookmobile serviced the local schools of Deschutes County, increasing school circulation by 1000% in its first two years of operation. The library’s first bookmobile was destroyed in a garage fire in 1948, only a few weeks before the start of school. 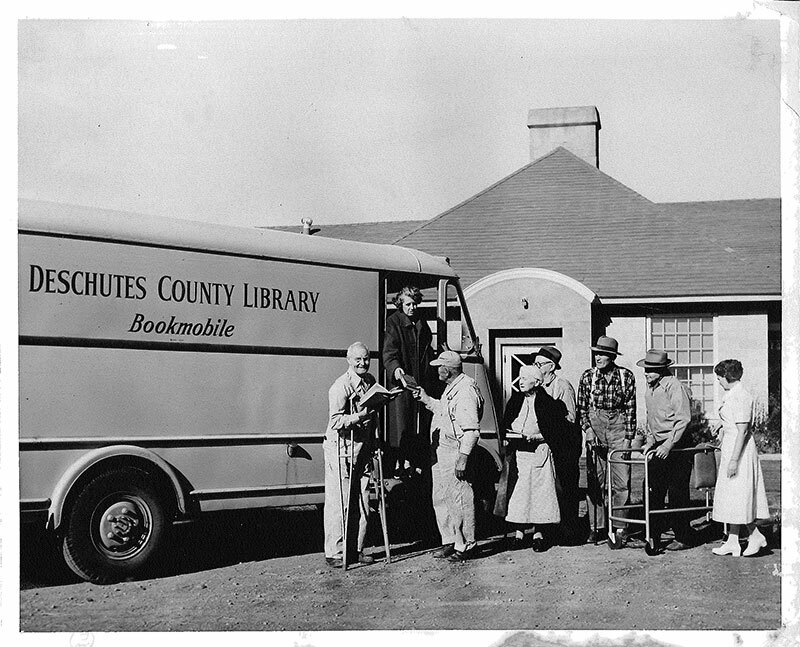 A new GMC truck was purchased in Bend, however it needed considerable alteration to function as a bookmobile. A local truck dealer, a cabinet maker, and a blacksmith collaborated on the job and finished it just in time for the start of school in 1948. 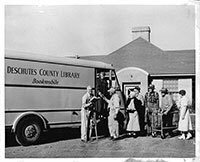 In addition to the schools, the bookmobile serviced outlying communities of Deschutes County, including Alfalfa, Brothers, and Terrebonne, as well as the Sunset Nursing Home and the Brooks-Scanlon Lumber Camp at Sisters. Do you have any old stories or photos to share about the library? E-mail us at libraryreference@dpls.lib.or.us. Photos generously provided by the Des Chutes Historical Musuem. News articles from Historic Oregon Newspapers.